Alpine Aerotech is best known for its comprehensive maintenance, repair and overhaul (MRO) capabilities; serving leading makes and models of helicopters worldwide. What many may might not know is that it also leases a large fleet of transport category aircraft equipped for a variety of utility operations. This unique perspective on maintenance and operations has led it to invest in a series of cost-effective specialized repairs. 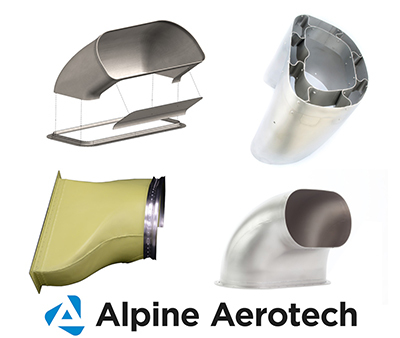 Alpine Aerotech approaches each repair with one goal; return damaged parts to serviceable condition while enhancing the original design by incorporating simple, unique improvements. Relying on its maintenance experience, it has first concentrated on parts that have frequent damage including (but not limited to) air management parts for Bell, and Sikorsky Helicopters. These approvals also allow Aerotech to repair parts that have limited specifications in their applicable maintenance manuals. If you have a part that constantly requires repair, visit Alpine Aerotech at booth #C2634 during HAI to discuss how it can help. “Depending on the complexity, we can develop an approved repair within a couple months,” explains Taylor Wilson, manager of Manufacturing at Alpine Aerotech. “By looking at the part and how it works within the system we have a better idea of why damage is occurring and can therefore incorporate design features to help mitigate that damage." For more information, email sales@alpineaerotech.com.